Images of an early digital introduce inner qualities of a masterpiece by Eric Owen Moss. 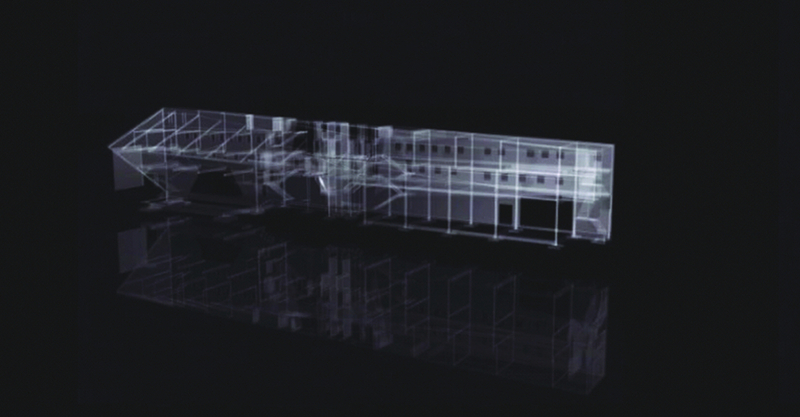 Digitally animated sections, diagrams, images of the site and the completed building all come together to reveal the design process, from the concept to the completion, of the "Stealth", a project by Eric Owen Moss located in Culver City. The video is conceived as a stratification of visual tools as well as to show the architectural project as an object to manipulate. A former abandoned industrial warehouse was transformed into a long building - usable as ofﬁce space for design companies or ad agencies - with a variable and multifunctional sequence of inside rooms and outside areas, in order to "investigate a changing exterior form and a varying interior space". "Stealth" is located in a part of the city refurbished by the Samitaur Smiths developers' investment. Cooperating with the investors, Moss transformed low-slung commercial buildings in eye-catching forms and assembled Conjunctive Points", a collection of architectural experimental building standing in the urban frame like one to one scale architectural models. Selected for INTIMACY, the 2003 edition of the BEYOND MEDIA Festival organized by Image.